There really is not much information on this company and at first there was quite a confusion with another factory in Oberkassel near Düsseldorf that not only carried nearly the same name of ⇒Rheinische Porzellan-Fabrik G.m.b.H. but also had actually been taken over by a businessman originating from the city of Mannheim. However the name itself was purely coincidal and there was no connection between these two companies. The small factory founded by M. Sterner was named 'porcelain manufactory' but actually produced both porcelain and fine stoneware items, mostly standard household goods but also a small range of decorational and promotional items. Business was not very good and so Sterner gladly took on an offer to sell his factory in 1899. Shortly after the turn of the century the factory came into possession of various molds from the former Porzellanmanufaktur Frankenthal, which had closed one hundred years earlier. The company instantly created a series of fakes with the Carl Theodor 'C.T.' mark until a local historic society was able to re-purchase the molds. The factory in Mannheim-Käfertal had 200 employees around 1913, producing household goods and cheap decorational items with both 'Strohblume' (Strawflower) and 'Zwiebelmuster' (Blue Onion) decorations. At that time it also had own clay pits and exported many items to Dutch East India. In all greater wars such things as simple soap were of course rationed as it included fat which was needed for the war effort. Many people tried to create a fatless soap using all kinds of material and some porcelain and earthenware manufacturers actually created products offering an alternative. 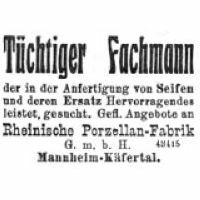 Now if you have a look at the marks section below, the 'Rheinische Porzellan-Fabrik Mannheim' was actually looking for a 'skilled employee' to create 'soap and soap relacements' through an ad in the Seifensieder-Zeitung dated 1916. Like so many smaller companies the Rheinische Porzellan-Fabrik Mannheim G.m.b.H. was badly shaken by the World Financial Crisis and was not able to recover, finally closing in 1933. Used between 1892 and 1899, registered at the ⇒R.W.Z.R. under registration №·20·946 on December 9th 1896. It was officially deleted in 1907. Used between 1899 and around 1909, registered at the ⇒R.W.Z.R. under registration №·42·204 on February 9th 1900. 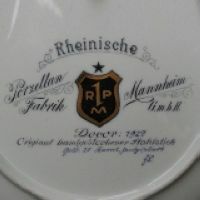 Used between 1899 and around 1909, here the elaborate markings on decorational plate. 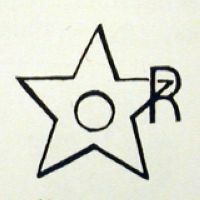 Used between 1909 and around 1933, an impressed mark registered at the ⇒R.W.Z.R. under registration №·118·588 on June 8th 1909. 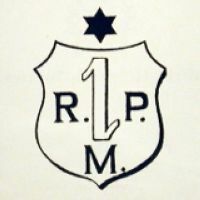 Newspaper advertisement from 1916 in which the R.P.F. 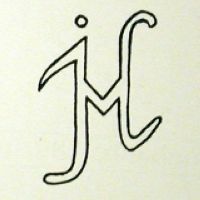 is searching for an employee to make soap.